Seamless High Purity Cellulose Thimbles, Primarily used in a Soxhlet Apparatus for extracting soluble compounds using organic solvents and for dust sampling. Size (mm) I.D. x Ext. 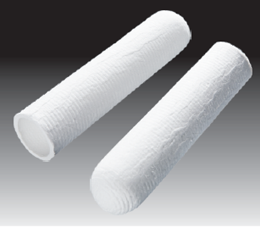 L.
These Borosilicate Glass Fiber Thimbles are recommended for use in extractors or dust monitoring devices where temperature is very high, above 500°C, or where acid resistance is required (except hydrofluoric acid).